Interoperability is the focus of many projects within the blockchain ecosystem at the moment, with several platforms developing solutions that will facilitate communication and the transfer of assets between disparate blockchains. The Bytom project, however, isn’t aiming for mere cross-chain interoperability — instead, Bytom aims to connect the digital and “atomic” worlds, bringing off-chain assets on-chain. The Bytom white paper outlines the purpose of the project as “connecting the atomic world and the byteworld to promote the interaction and circulation of assets between the two worlds” — but how does Bytom compare to established asset digitization platforms such as LAToken or NEO? The China-based Bytom project is a new blockchain platform that intends to unify multiple assets into one single blockchain solution. Unlike other interoperability projects, which aim only to bring specific off-chain assets onto the blockchain or facilitate cross-chain interaction, Bytom has set out with the lofty goal of bringing what the Bytom team calls “atomic assets” onto the chain. The immutable nature of blockchain technology, argues the Bytom team, will function as the foundation of the future economic structure. Bytom aims to create an open platform for the registration of byte assets, standardizing the creation and definition process in a user-friendly manner. The Bytom creators highlight three primary use cases for the platform. The Bytom project firstly intends to create an ecosystem in which users can manage and trade income assets, facilitating dividend distribution via smart contracts. Income asset holders will be able to quickly exchange their rights of income with other platform users via a baked-in Bytom escrow and wallet system. Bytom also aims to make it possible for users to manage non-listed company options and private fund equities. Shareholder information will be publicized on the Bytom blockchain to register ownership, making it possible for shareholders to execute share transfers and circulate assets in a streamlined and secure manner. The third use case presented by the Bytom team is asset securitization. Leveraging blockchain technology, Bytom intends to make it possible to simplify the asset-backed securitization process into registration, tokenization, and smart contract transactions. 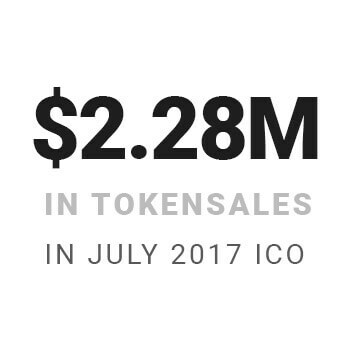 The Bytom project was launched via a successful ICO that began and ended on the 20th of July 2017, capturing over $2.28 million USD in token sales. Interestingly, Bytom boasts a unique blockchain architecture that uses an ASIC-friendly Proof of Work consensus mechanism with a quasi-SegWit design. Bytom uses a three-layer architectural model that consists of an application layer, a contract layer, and a data transmission layer. The entire platform, however, will operate in a relatively simple manner — apart from functioning as a basic tool for asset ownership exchange, Bytom wants to streamline the process involved with digitizing virtually any asset. Bytom’s company equity management process provides users with a platform that allows for the registration, management, and exchange of digitized assets. Users can define a share structure, share options, and plan option maturity, as well as manage granting, approval, and sign-offs. The Bytom asset registration process also provides users with legal consultation and allows for corporate governance changes to be executed via smart contracts and blockchain-based identity verification accompanied electronic signatures. The process involved with asset securitization via Bytom is similarly simple. To create an asset-backed security on the Bytom platform, users need only to register and tokenize their asset, with transactions managed by smart contracts. The structure of Bytom’s solution also makes it ideal for fundraising programs such as initial coin offerings. When investing in Bytom-based projects, backers can trade assets quickly and simply via the Bytom platform via a built-in p2p exchange. The Bytom ecosystem is powered by Bytom Coins (BTM), which are the native asset of the Bytom blockchain. BTM is used to pay for network fees on the Bytom blockchain, as well as functioning as a representation of ownership that allows users to participate in the Bytom governance structure. 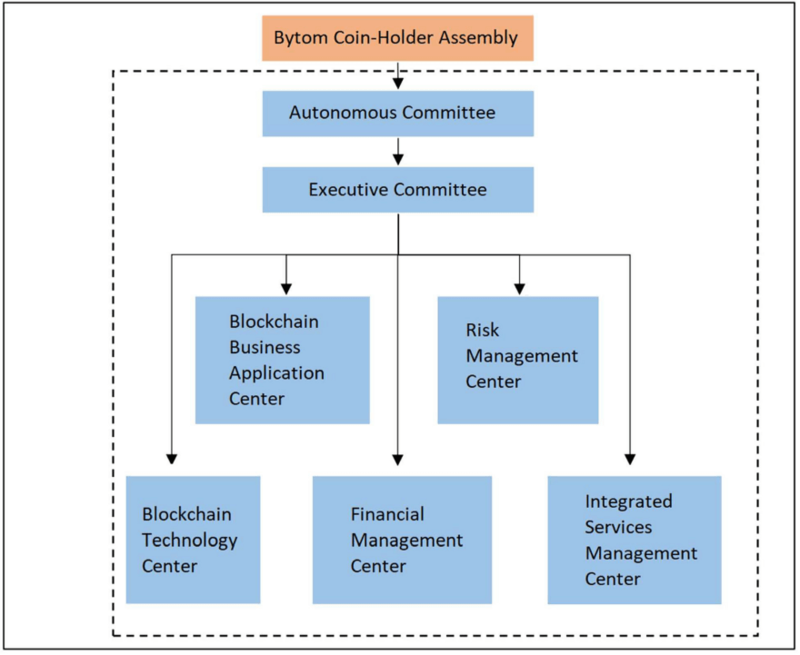 The Bytom governance structure resembles a corporate governance structure. Bytom coin holders form the Bytom Coin Holder Assembly, who vote to elect members of the Autonomous Committee, who, in turn, elect members of and supervise the work of the Executive Committee. The Executive Committee performs Daily operational matters, such as the operation of the blockchain technology development, the blockchain business application center, and financial and risk management. The Bytom governance structure is intended to establish a pure open source platform that delivers obligation and responsibility driven by token holders, striking a balance between fairness and efficiency. Bytom’s three-layer platform model is a refreshingly innovative tech stack in a world of ERC20 tokens and mundane blockchain architecture. The most straightforward level of the Bytom stack is the application layer, which allows PC, web, and mobile apps to call smart contracts to facilitate asset management. Under the hood, however, the structure of the Bytom platform becomes more interesting. 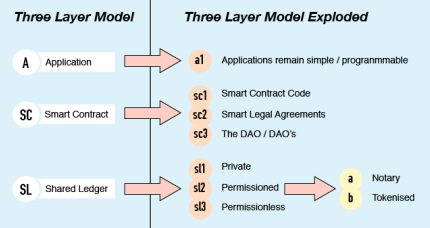 The second layer of Bytom’s platform model is the smart contract layer, which consists of a genesis contract and a general contract. Bytom’s genesis contract is unique to the platform and can both issue and audit smart contracts. This contract can execute standardization and automate the auditing process to ensure assets issued on the platform correspond to rules defined by the development team. Bytom’s second layer also includes general contracts, which manage the trading of assets and the establishment, verification, and distribution of dividends. The third and final layer of the Bytom model is the most complex, functioning as the “Master Program and Data Structure.” This layer consists of the permissionless public blockchain layer, which manages asset issuance. The Bytom consensus mechanism is built upon Ethereum and Bitcoin’s Proof of Work model and proposes a mechanism that is “friendly to AI ASIC chips,” providing miners with a solution to the hardware consumption issue presented to PoW miners. 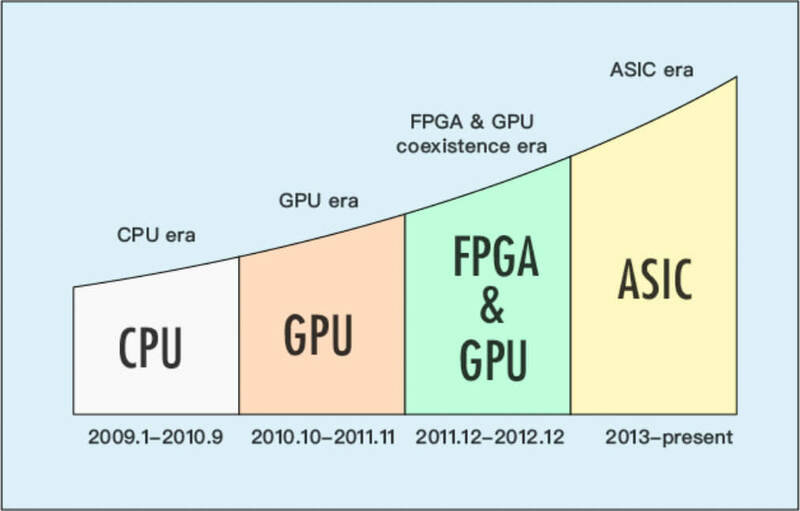 The benefits of an AI ASIC-friendly consensus algorithm, according to the Bytom dev team, include the opportunity for outdated mining farms to transform into data centers that provide AI hardware acceleration services. Bytom maintains a highly active community, managing a dedicated subreddit, Discord, Twitter, Facebook, Medium blog, Github, and forum. Progress on the Bytom project is progressing steadily, with the first step of the Bytom “asset blockchainization” process taking a major step forward with the announcement of a partnership between Bytom and East Lake Big Data Asset Exchange. 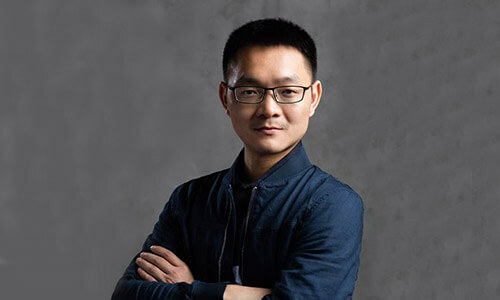 Duan Xinxing is the former vice president of exchange platform OKCoin and has worked with the development of both OKCoin and OKLink. Bytom’s CTO, Lang Yu, is a former Alipay senior system engineer and is the developer behind a highly popular Chinese Bitcoin-based crowdfunding site. Apart from the recently announced partnership with East Lake Big Data Asset Exchange, Bytom is also partnered with ConsenLabs — the creator of the imToken wallet app. The strategic partnership is intended to foster increased growth across both organizations through mutual assistance with marketing, community engagement, and blockchain technology integration. Bytom partners with celebrated Institutions and companies. Bytom token performance has remained relatively stable since launch and has experienced steady growth. With a launch value of roughly $0.11 USD, BTM quickly surged to $0.30 as initial investor interest peaked. Token value then stabilized at the $0.12 level after a sharp correction, where it remained over the course of the late 2018 bull run. Recent roadmap milestone achievements, however, combined with news of strong partnerships and increased community engagement efforts have brought investor attention to the promising project, resulting in an early April breakout that has seen BTM surge to over $1 USD. A short correction period over the last week has seen BTM stabilize at $0.89 USD. Bytom is currently trading across 29 different exchanges, with the highest volume traded via the BTM/BTC pair on Bibox with a daily volume of $11 million. 24-hour BTM volume amounts to 67 million, with roughly $10 million in 24-hour volume traded across Huobi, OKEx, and Bibox. Bytom takes the concept of asset digitization very seriously — rather than attempt to create a bare-bones asset digitization platform, the Bytom dev team intend to create a fully-realized ecosystem that facilitates the creation and trade of a wide range of assets that are currently limited to traditional financial systems and markets. The Bytom team is led by individuals that boast extensive experience in the blockchain space and has consistently hit roadmap goals since launch. With the public release of the Bytom algorithm set to occur this week and strong investor sentiment, Bytom appears set to lock in its recent gains and establish a strong presence in the asset digitization sector. For more information about Bytom, including price, market cap, and social media links, please see our Bytom coin profile.